As President Donald Trump points to CNN's Jim Acosta, a White House aide takes the microphone from the reporter during a news conference in the East Room of the White House, Nov. 7, 2018, in Washington. “History will see what a good job we did in getting people over the finish line,” Trump said, noting that nine of the 11 candidates for whom he campaigned in the past week were victorious. Trump also vowed a “warlike posture” if the Democrats pursue such investigations. 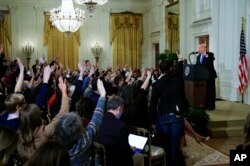 “They can play that game, but we can play better because we have a thing called the United States Senate and a lot of questionable things were done between leaks of classified information and many other elements that should not have taken place,” Trump said during the nearly 90-minute session with reporters in the White House East Room. “Now we have a much easier path because the Democrats will come to us with a plan for infrastructure, a plan for health care, a plan for whatever they’re looking at and we’ll negotiate,” Trump said. He portrayed his party’s retention of the Senate and picking up gubernatorial seats in key states as victories by an outgunned underdog. Although Trump has regularly insulted reporters, his remarks Wednesday reached a fresh nadir. Journalists repeatedly were ordered to desist and accused of asking racist and insulting questions. The president also ordered microphones taken away from those he no longer wanted to hear from. CNN’s Jim Acosta was repeatedly admonished by Trump as a rude person who should not be working for the network and accused of treating White House press secretary Sarah Sanders and others in a horrible manner. Later Wednesday, Acosta’s permanent press credentials for White House entry, known as a hard pass, were pulled. CNN, subsequently, issued a statement defending its chief White House correspondent, accusing Sanders of lying about the incident. Anyone having doubts that the White House reaction “was disproportionate to the perceived offense to view the video of the events from earlier today,” the WHCA statement concludes.